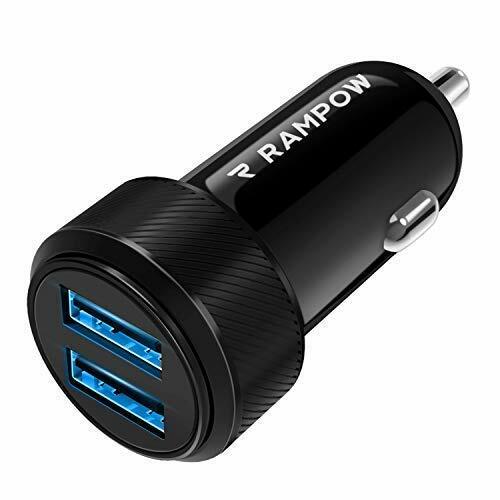 Safely charge up to 2 devices when driving with RAMPOW 24W Car Charger. Each port inside the car charger can deliver up to 5 V, 2.4 A (12 W) to your device. With LED lights built in, you can easily connect devices to the car charger in low-light environment. 1. Compact Size: We design it and made it compact. It will be a perfect fit in your car. 2. Safe and Powerful: Although it is small, it can still juice up your devices powerfully and safely. The built-in USA smart chip detects the safest and fastest charging speed your devices need, and it provides short circuit, over-voltage and over-current protection. 3. 2-Ports: Your friends or family can get all their phones charged. Each port can deliver 5V, 2.4A (12W) power, and it is ideal for charging an iPad. 4. Universal Compatibility: Universally compatible with vehicles with DC 12-24 V (Cars, SUVs, Vans and Trucks). It also means you can charge all smartphones, tablets, accessories: Samsung, Huawei, OnePlus, LG, phones. 5. LED indicator: In low-light environment, the charging port is able to be seen with blue LED lights. 6. Excellent Customer Services: We provide helpful and responsive support to our customers.